The Turkish president meets Francis: the situation in the Middle East and the need to "promote peace and stability in the region through dialogue and negotiation, with respect for human rights and international law". Beyond the cordial climate and the good relations existing on the diplomatic level, there no full religious freedom in Turkey. Vatican City (AsiaNews) – The Middle East, and in particular Jerusalem, but also refugees, human rights and the situation of Catholics in Turkey were at the heart of talks between Pope Francis and Turkish President Recep Tayyip Erdoğan. The Pope received the Turkish leader this morning at the Vatican, before the President’s meeting with the Cardinal Secretary of State, Pietro Parolin accompanied by Msgr. Paul Richard Gallagher, Secretary for Relations with States. A statement released by the Vatican states that “during the cordial discussions the bilateral relations between the Holy See and Turkey were evoked, and the parties spoke about the situation of the country, the condition of the Catholic community, efforts in the reception of the many refugees and the challenges linked to this. Attention then turned to the situation in the Middle East, with particular reference to the status of Jerusalem, highlighting the need to promote peace and stability in the region through dialogue and negotiation, with respect for human rights and international law". The meeting with the Pope lasted about 50 minutes, only the interpreters were present. "I thank you for your interest", said Erdogan to Francis, according to the journalists present. The Pope in turn thanked him for the visit. Erdogan was accompanied by a delegation - a procession of about thirty cars and minivans - comprising twenty people. Among them also the president's wife and daughter and five ministers. There were six women in all (of whom four wore the veil). At the time of the exchange of gifts, Francis gave Erdogan a medallion representing an angel and explained: "This is an angel of peace that strangles the demon of war. It is a symbol of a world based on peace and justice ". 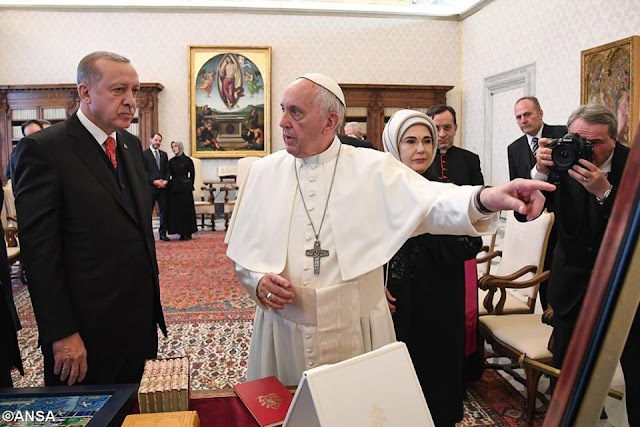 The Pope also offered Erdogan an etching with the design of St. Peter's Basilica as it was in 1600, a copy of the encyclical Laudato sì and the message for the World Day of Peace this year. Erdogan gifted the Pope a large ceramic picture with the panorama of Istanbul and a box set of books by the Muslim theologian Mevlana Rumi. Erdogan's visit to Pope Francis is the first visit of head of state from Ankara to the Vatican for 59 years. The last was Celal Bayar, received by John XXII, who had been nuncio to Turkey between 1934 and 1943. Beyond the cordial climate and the good relations existing on the diplomatic level, it cannot be said that one can speak of full religious freedom in Turkey, despite the Constitution desired by Ataturk to affirming the secular state. Beyond the even violent episodes of intolerance – which culminated with the murder of Don Andrea Santoro in 2006 and Msgr. Luigi Padovese in 2010 - other incidents are not rare, even if fortunately not bloody. In the country, the churches do not have legal personality, which prevents, among other things, it owning religious buildings. This obstacle is sometimes overcome with the creation of false foundations that however fall under ordinary civil law. Thus, even a few weeks ago, there were confiscations of religious properties, including historical and ancient ones. Moreover, it is forbidden for Christian churches to have the crucifix visible from the street. This is why, usually, the facade is hidden inside a courtyard. This is the case even for the headquarters of the Ecumenical Patriarchate of Constantinople, the highest expression of orthodoxy. And the patriarch, to whom no supranational role is recognized, must be a Turkish citizen.